The Saturnalia is one of the most festive and uninhibited that the ancient Romans celebrated. It went on for seven days and encompassed the Winter Solstice, a time of religious observance for cultures the world over. Feasts were provided by the temples and were open to the public, the poor and the homeless. Servants and masters were met on equal terms. Unable to prevent the people's festive inclinations at this time of year, the early Christian leaders moved Christmas from January to December and claimed the celebration for their own. During the Saturnalia, rules were set aside, schools were closed, and slaves could meet their masters on equal terms. Human kindness was the theme and war and the punishment of criminals was halted. The exchange of gifts was universally practiced. Strenae, which were boughs to which were attached cakes or sweetmeats, were exchanged by visitors and guests. Other common gifts included wax candles (cerei) and sigillaria, which were doll-like clay figures, a particular favorite of children. On this day in 44 BCE, Cicero delivered the third of his famous orations, called the Phillipics, that were opposed to Mark Antony and ins upport of a return to democracy. The emperor Vitellius was murdered in the Forum this day in 69 AD. His body was thrown first into the sewers, where he was renamed Sewerinus. But because it got stuck (he was somewhat obese) it was pulled out and thrown into the Tiber, where he was renamed Tiberinus. Mother Night is an Asatru festival honoring Odin, Ing, and Erda. Dreams tonight foretell the outcome of the New Year. In the Norse calendar, Mother Night, the day before the Yuletide season, named for geola ("yoke"), the day in the year when the Sun is above the horizon for the shortest time, following and preceding the two longest nights of the year. 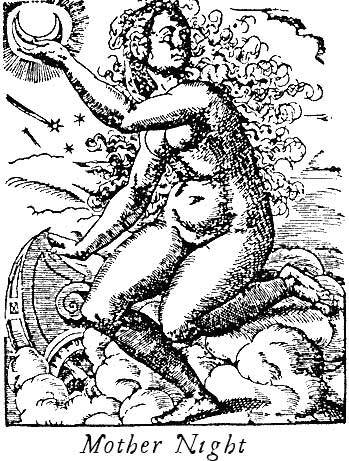 Mother Night, as the longest and darkest night of the year, is considered the womb of the New Year. It is customary on this night to pray for auspicious dreams, which are said to foretell the year to come. In the Asatru tradition of the Celtic and Norse peoples, Mother Night begins the 12-day Yule cycle, in which the fading of the old year is marked in rites of the Holly King. Freya, the Norse Goddess of Love, female fertility and creativity is honored with evergreens and fires, feasting and singing at the start of her festival, which later became the 12 days of Christmas. The word Yule comes from geola, the "yoke" that joins the old and new years. Sweet Elder, I shake, I shake! Where is my lover tonight? Then listen carefully. The goddess Holle will send her white dogs in the direction from which your future lover will come. If you are quiet and patient, you will hear them barking. And in my arms may him embrace. Then sleep with the onion under your pillow. What I find interesting about this folk custom is that both onions and the circle surrounding a dot are sun symbols, so this seems to be a charm relating to the sun, which is born again on Winter Solstice.